You are here: Home / Uncategorized / Pray More. Pray Better. Pray Deep! Pray More. Pray Better. Pray Deep! If you’re being honest, how would you describe your prayer life right now? Strong and vibrant, something you crave and leaves you feeling invigorated, a time you feel God’s power and receive His guidance? Or, lukewarm, stale, a task to check off each week, a list to ramble through, but not feeling the impact? Or, vacant and tepid, something you do at church on Sundays or maybe a list to run through at night with your children, but not something you give much thought to during the week? Or does it make you feel inadequate or uncomfortable, not sure you’re good enough at it to really try? I’d venture to guess we’ve all felt most of these at some time in our lives. Maybe you’ve never known prayer as anything more than as what you say together in church or a laundry list of names you run through at bedtime. Maybe you’ve tried prayer and didn’t see any results, so you gave up. Or, you just don’t feel like you’re very good at prayer, so you don’t try as often as you’d like. But what if prayer could be something you looked forward to each day, a time you craved and came away feeling invigorated? What if prayer became a powerful force in your life, a time to palpably feel God’s power in your life, to receive His guidance, and to truly impact the lives of others through your prayers? 1) Learn to listen for God in prayer. Prayer is our conversation with God, yet too often I did all the talking. I used my prayers to list out all my requests and name all the people who needed God, but I didn’t give God a chance to speak. I didn’t share my life with Him, didn’t talk about my hopes and dreams, or ask Him for guidance. When I began to listen and give God space in my prayers to speak, I realized prayer truly could be a two-way conversation. I found prayer to be more about developing a relationship with God, than a time to list everything in my world that needed God’s help. After all, God already knows our requests, but He wants to engage us in conversation over those needs. 2) Utilize a variety of prayer methods to connect with God in different ways. For the longest time, I really only knew two ways to pray. One was the corporate prayers at church, where the words flowed almost poetically and the one leading the prayers seemed to knew exactly what to pray. While I loved hearing these prayers, they greatly intimidated me and made me feel like I never had the right words to use in prayer. The other way was my fumbling attempt to go through my prayer list, but it always felt a bit like taking my Christmas list to Santa as a child. I would go through my list of all the things I wanted God to fix in the world around me. If you’re looking for a guide to connect to God in prayer more deeply and ignite your prayer life, I’ve just published “Pray Deep”, a 21-day guided prayer journal to help you explore the nature of prayer and experience different ways to pray. This journal will take you through almost 20 different prayer methods, utilizing scripture, art, writing, movement, and listening to engage different senses and styles. As a companion book, look for the “Pray Deep Prayer Journal” to record your own prayer journey. This journal provides pages to record your prayers, your key scripture verse, and how you hear God responding each day. 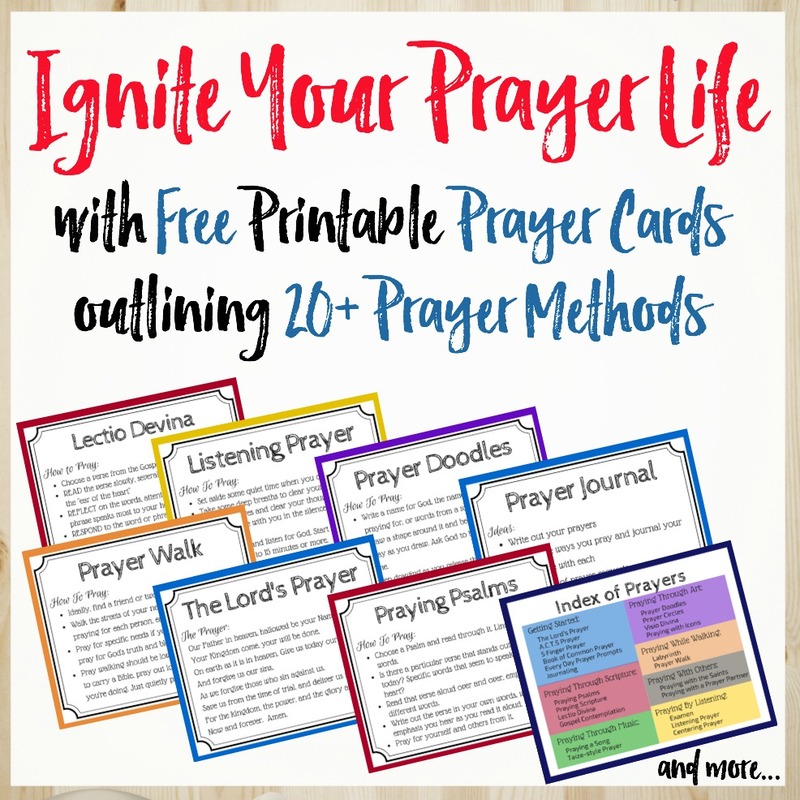 It also includes a section to track prayer requests and God’s responses to those prayers, along with a reference section of 23 different prayer methods and how to use each one. These journals will make great additions to your prayer war room or as gifts for friends who want to grow in their prayer lives. Or, use “Pray Deep” as a study tool with a small group and explore prayer together, sharing your experiences with each of the prayers. Glad to help get your day started! What a blessing to have so many students praying this morning! Congratulations on your book. I think we all need some fresh ideas to perk up our prayer life and learn to pray at a much deeper level! One thing I’ve learned recently is to pray with Thanksgiving – not thanksgiving for what God has already done (of course that’s good too), but thanksgiving for how He is going to answer the prayer request that I have just laid at His feet. So glad I popped by! I love how we connect differently through different types of prayers. Love how He’s led you to pray thanksgivings for how He is going to answer your request. He led me to stop praying for my own needs for the whole season of Lent and instead focus on Him and others. It rocked my world – and in the process, I found greater clarity on where He was leading me. Big Congrats Kathryn on your new books. I just shared about it. Praying that your books blesses its readers in Jesus Name. Thanks, Ifeoma! Writing and experiencing the prayers when I wrote the Pray Deep blog series transformed my own prayer life and I’m praying these journals will do the same for others! Thank you, Tai! I just love that this series had such an impact for you. It did for me, too! I started this journal series (more are coming!) to help others similarly experience a transformation in their prayer life. Love the idea of prayer beads – I thought about including them in the series. Definitely something I’d like to try. Need to carve out more time to write 🙂 but, I have one in the works for Advent and another one focused on “Be still and know that I am God” Stay tuned… I’m super-excited about these, too! Congratulations on your book release, Kathryn! How exciting! I can see from reading this post (and from reading your blog several months now) that you have so many things to teach us about prayer. I look forward to going through my copy of Pray Deep! Thanks so much for sending it (and your sweet note.) Looking forward to it, and I’ll be in touch soon. Thanks, Betsy! Writing and experiencing prayer through Pray Deep transformed my prayer life and I hope I can share that spark with others through this series of journals. I look forward to hearing your feedback! So true — prayer is conversation with God, our opportunity to think about Him, call to Him, talk to Him. I never liked corporate prayer — but for the longest time my prayers sounded stilted and awkward, the way they do in a group setting. It was when things got really difficult, and what I felt inside was just bursting to come out, that prayer finally became clear, raw, honest, and good. I love how we can come to God with eloquence or fumbling words or no words at all and He’ll listen just the same. I think he must love it when the words come tumbling out in their most raw and honest form because that’s when our hearts are really open to Him. I’m off to take a closer look at your book. Perhaps it would be a good fit for our Women’s Prayer group at church. I don’t have ‘look inside’ ready yet at Amazon, but it’s basically the ‘Pray Deep’ blog series with specific prayer prompts to help you experience the prayers. You can find details on ‘Pray Deep’ here: //www.kathrynshirey.com/pray-deep/. Let me know if any questions on the book. Thanks for the link, Kathryn! Prayer is a hot topic right now but if you think about it that should be the case all the time. I am praying that your books are being well-received and that the word is getting out.